Get firewall friendly connections for external data sources to Oracle, SQL Server, PostgreSQL, Redshift, IBM DB2 and more. Our OData services include exclusive features for use with Salesforce Connect. 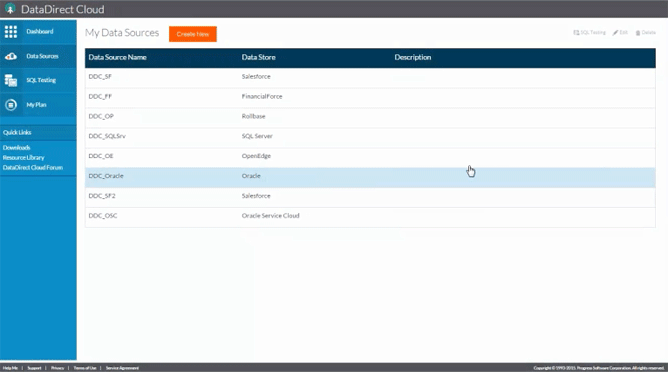 Integrating external data with Salesforce applications has never been easier thanks to Salesforce Connect that can help you consume data from any OData producer. External data objects can be configured in minutes. But the picture isn't complete without the real-time connectivity provided by our Hybrid Connectivity Service - DataDirect Hybrid Data Pipeline. The combination of Salesforce Lightning Connect and DataDirect Hybrid Data Pipeline empowers your team to access back office data instantly and easily from Salesforce applications. Get rapid connectivity to data residing in the cloud and on-premise so you can get applications out the door faster. Hybrid Data Pipeline provides the OData service that allows your Salesforce applications to access back office data in real-time.